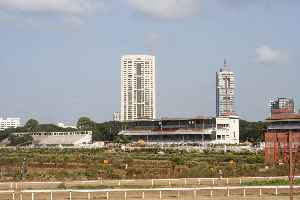 The Mahalaxmi Racecourse is a horse racing track in Mahalaxmi neighbourhood, of Mumbai. The track is oval shaped with 2,400 metres (7,900 ft) straight chute, spread over approximately 225 acres of open land in the heart of Mumbai city. It was created out of a marshy land known as Mahalakshmi Flats. Built in 1883 & modelled on the Caulfield Racecourse in Melbourne, it is spread over land facing the sea. It was originally donated by Sir Cusrow N Wadia and today it is on lease from the Municipal Corporation of Greater Mumbai (MCGM) to Royal Western India Turf Club which runs the racecourse. The Grandstand, off the course, is a designated heritage structure. The racecourse is the only helipad open for civilian use in South Mumbai.